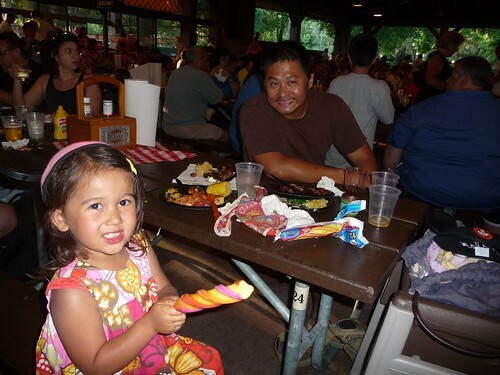 Mali Mish – Day 75: Mickey’s Backyard BBQ. Day 75: Mickey’s Backyard BBQ. 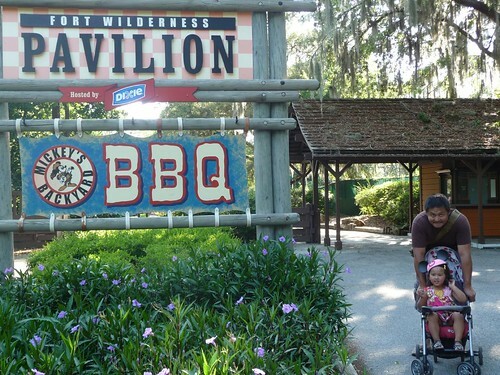 Today was our last full day at our Disney campground, Fort Wilderness. So we did what we always do on our last day at a site. Live it up. Pool, water slides and plans for a little bbq at our campsite. 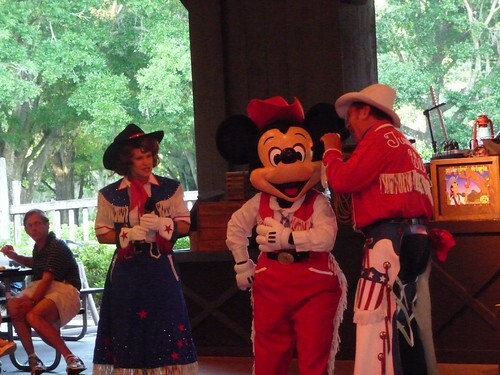 On a whim, I went to talk to the folks at Fort Wilderness about the sold-out Mickey’s Backyard BBQ. And low and behold, they had a few walk-up tickets left. Ava’s lucky day! And you know what else? It was all you can eat and DRINK. Our lucky day!! 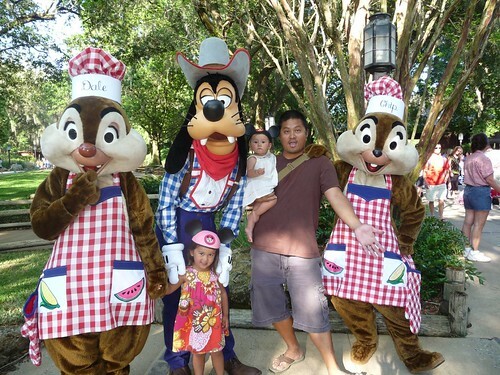 As soon as we walked into Mickey’s Backyard BBQ, we got to meet Goofy, Chip and Dale. Nice heel pose, Dan. 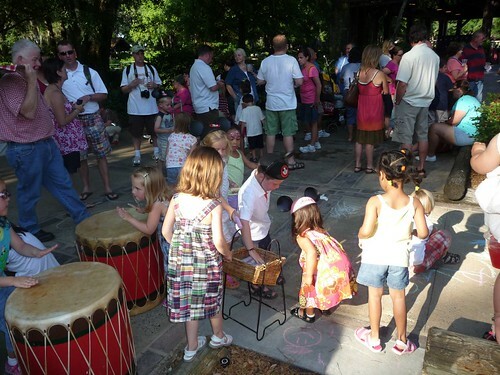 Then we were handed lemonade and the kids we allowed to create sidewalk art and play drums while we waited for Mickey to finish cooking our meal. Dinner is ready!!! On our way into the outdoor dining area, they were handing out beers instead of lemonade. How about that! The food was decent. The beer was Bud Light. And they had all you can eat ice cream too. And no, no one got drunk from what I can tell. We all had kids to watch. Duh! 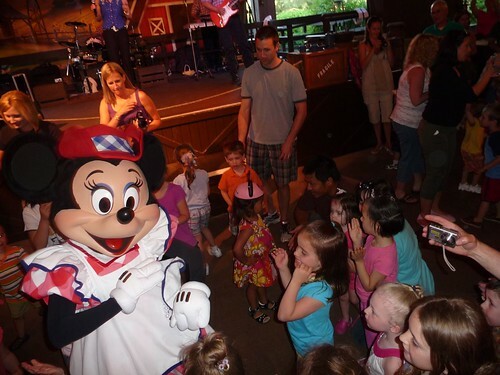 Before we knew it, the mouse himself came out and the kids went nuts. 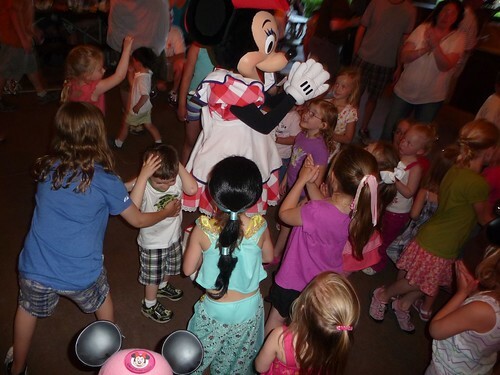 All the kids were allowed to join them on the dance floor. 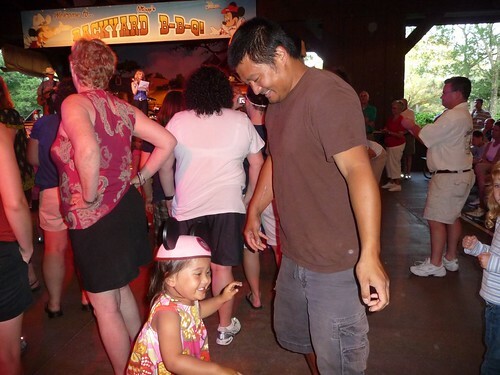 Ava was one of the first kids on the dance floor and super excited. 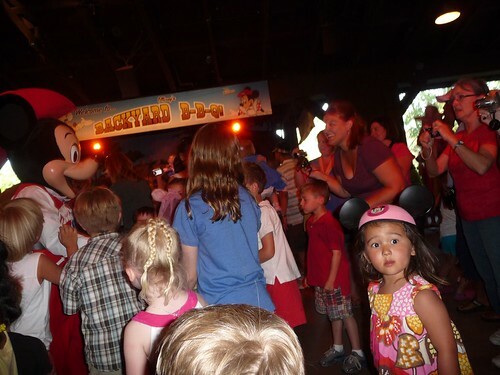 But then a million other kids also showed up and she got a little intimidated. See the black and pink ears on the bottom the picture? That’s as close as Ava got to Minnie Mouse. But don’t worry. Dada Dan was there to save the day! It sorta felt we were crashing a wedding reception. So the moral of the today’s story is… if your kid is shy, it probably isn’t the best idea to shell out a nice chunk of change on this BBQ. Even with the lure of free alcohol. 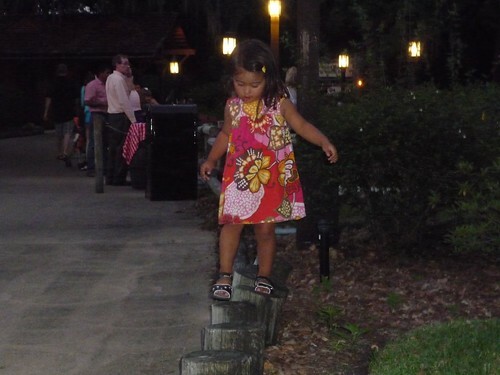 Ava spent most of the time outside, walking on walls, playing hide-n-go-seek, and screaming ‘you can’t caaaaatch me!’. 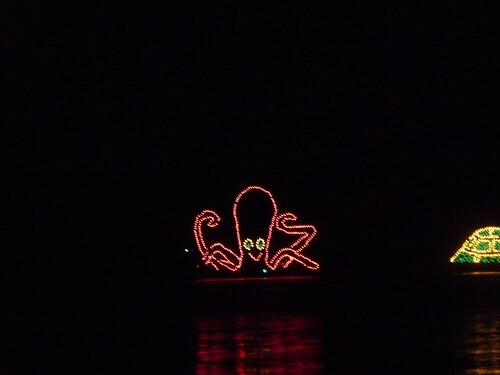 To make sure we covered all the free stuff that the campground had to offer, we put the kids into their pajamas and headed out to the beach to wait for the water electric parade. And it was super cheesy but super awesome at the same time. Yup, that is possible. It was as close as I was going to come to see the electric parade that Disneyland canceled many moons ago. Besides this, the Magic Kingdom did also still have the Hall of Presidents and Country Bear Jamboree which were also gone from Disneyland. Good night, little one. I hope you loved every second of this place. Driving inland to Camp Podkraj in Virpazar, Montenegro. Kotor, Montenegro: An old fortress with a million cats. Day 74: Round 2 at the Magic Kingdom. Day 76: Downtown Disney and on to St. Augustine. 2 Responses to Day 75: Mickey’s Backyard BBQ. Love the heel pose Dan! You should really consider becoming a cast member at Disneyland when you get back to California 🙂 Then you could get your wife and daughters in for free and possibly get discounts at the Magic Kingdom for next time.